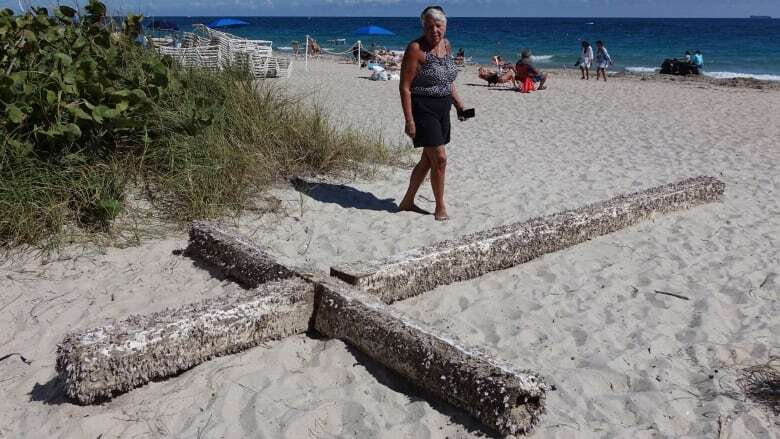 A six-metre cross covered in barnacles washed up on the shores of Fort Lauderdale, Florida — just in time for vacationer Chris Gay to see it and pull it ashore. In the depths of winter, some vacationers may be thanking God for Florida beaches. But they probably don't expect God to respond. But as her trip south comes to a close, Chris Gay is definitely feeling a holy presence — after finding a giant, six-metre cross on the beach. "It's a once in a lifetime event that will probably never happen again," Gay told As It Happens host Carol Off. Gay and her partner had just checked in at their Fort Lauderdale hotel when they decided to head to the beach and feel the sand between their toes. "We were walking on the beach and it literally came right to our feet," Gay said. When the couple first spotted the massive object floating ashore Gay says she did a double-take before realizing it was a cross. "It is definitely a cross. There's no and, ifs, or buts — not a utility pole, and nothing else, but a cross," Gay said. "Whatever they used had to have been a large tree because it wasn't several pieces. It was only two pieces of wood with four big bolts into it." The wooden cross is painted white and appears to be handmade. It's also covered in gooseneck barnacles, which Gay says may provide some clues about where it came from. Gay suggests tracing the origin of the cross back to specific areas where that species of barnacles live might be one option. Or perhaps, she said, it's from Puerto Rico and it was pulled from a church into the sea by Hurricane Maria. "It is super heavy," Gay said. "I don't believe somebody would have that sitting in their yard." Gay says tourists have been captivated by the cross after the hotel brought vehicles to help pull it ashore. Some beach-goers are taking selfies with it and others are praying next to it. "It has made such an impression in so many people — such a divine intervention of everybody coming together and feeling, I guess, taken by it ... spiritual," Gay said. The hotel is planning to keep the cross, but Gay is keen to know where it came from. "We were hoping that maybe enough video or pictures of this cross would go viral and so we can find out where it came from and how it was made, the origin of it," Gay said. Even though she couldn't bring the cross back to her home in Michigan, Gay says she found another smaller souvenir to remind her of the unforgettable vacation. "Ironically, the next day out on the beach, as I'm turning over sea shells and kind of kicking at the dirt, I got a little plastic souvenir that came up," Gay recalled. "It said, 'I love Jesus.'" Written by John McGill. Interview produced by Sarah-Joyce Battersby.